This failure to diagnose breast cancer lawsuit was filed by a woman against her radiologist and surgical oncologist in Prince George's County. It was filed in Health Claims Arbitration on March 21, 2017, and is the 131st medical malpractice lawsuit filed in 2017 in Maryland. Plaintiff has a bilateral digital screening mammograms of both of her breasts done at Defendant Laurel Radiology. The studies are interpreted by defendant radiologist, who finds that they depict a mass involving one-third of her left breast, but without any malignant looking calcifications. She also finds a questionable mass on the woman's right breast. Defendant radiologist recommends additional views and a possible sonography. Defendant conducts these studies five days later. This time, she finds that the area looks less suspicious and that there are no abnormalities. She recommends a six-month mammographic follow-up for the woman's right breast. Six months later, a diagnostic mammogram is done, and defendant radiologist reports no findings of a dominant mass or malignant looking calcifications. Another six-month recommendation is made for both breasts. The woman has bilateral mammograms done of both breasts at the recommended six month period. These show clusters of calcifications in the left breast with a "benign appearing" lateral mass. Defendant radiologist also reports no evidence of malignancy or abnormality but does not indicate which breast she is referring to. She continues to recommend annual mammograms and monthly breast examinations, without a follow-up study to evaluate the mass in the woman's left breast. A year later, the woman reports for her yearly mammogram. Another radiologist interprets this mammogram and compares the studies with the prior ones. She observes calcifications in the woman's left breast and a smooth nodule in the woman's left breast as an interval chance. She recommends additional views and an ultrasound of the left breast to further examine the calcifications. A month later, plaintiff returns to defendants to have the follow-up examinations done. She sees defendant radiologist, who finds multiple clusters of calcifications and a mass in her left breast but being benign in appearance and stable. Several clusters of calcifications involving her breast are also found. Due to the change and multiplicity of the calcifications, she deems them to be suspicious, and he recommends a biopsy. She is referred to defendant surgical oncologist for a biopsy. Defendant surgical oncologist reports that the biopsy procedure is very bloody but that there is adequate sampling. A repeat biopsy is recommended in three months after finding that the specimens did not indicate calcifications. The woman is never made aware that there was some question that the samples are not adequate to determine if they were cancerous or not. Plaintiff returns to Laurel Radiology for a follow-up after the biopsy and another mammogram is done by defendant radiology. She finds large areas of calcifications but says there is no change in the "probably benign" appearing mass in her left breast. She does not recommend a repeat biopsy. The woman has X-rays of her pelvis and spine done a few months later as she begins to have severe pain in her lower back and pelvis. These X-rays reveal the existence of metastatic disease in her bones. Due to these findings, a biopsy of her left breast is ordered again and she is finally diagnosed with invasive ductal carcinoma, grade 2, and a high-grade ductal carcinoma in-situ. She has a radical mastectomy of her left breast done in which a 2.4-centimeter carcinoma and a lymph node consisting of metastasis are removed. She has additional reconstructive surgeries planned. The plaintiff suffers from terminal stage IV breast cancer and extensive metastatic disease in her ribs, hip, and spine. This all causes her to continue to undergo radiation and rigorous chemotherapy to treat her cancer. Plaintiff files this claim against the radiologist and oncologist, alleging that their failure to recognize changes in the calcifications and failure to conduct proper biopsies led to the delay in the diagnosis of her cancer. This allowed the cancer to spread and become stage IV. Everyone agrees catching breast cancer early is critical. The five-year survival rate for breast cancer decreases from over 95% for early stage cancer to 22% for late stage cancer that has spread to the patient's organs. Therefore it is imperative for the radiologist to be vigilant in his/her review. But a big challenge in this case is going to be convincing a jury that this woman's outcome would have been different had she been diagnosed properly. Delay in cancer diagnosis cases are often fought on this battlefield of causation. 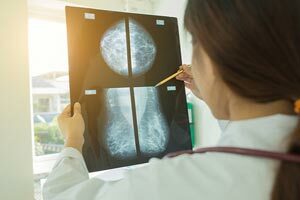 Defendants may go as far as to argue that the biopsy and mammogram reads were sufficient and was the negative finding was accurate. Prince George's County is generally a good jurisdiction for medical malpractice plaintiffs. Capitol Radiology, LLC; Laurel Radiology Services, Inc. If you have suffered a permanent injury due to the negligence of a doctor in failing to diagnose cancer, our firm can help you. Call Miller & Zois today to speak to a caring medical malpractice attorney who can help you, at 800-553-8082, or get a free online case review.